Better days are coming! They are called Friday and Saturday.. Our weekly roundup of the best parties in Abu Dhabi. The explosion of Caribbean rhythms, Jamaican cuisine and lots of fun with your friends - don't miss one of the season's biggest parties at Sheraton Abu Dhabi Hotel & Resort on 30th of September featuring international superstar reggae singer, J BOOG! Turning up the heat at Aloft Abu Dhabi once more, join 1000+ music fans asLiquid Rain Pool Party returns on 30th of September! Immense line-up to be announced, watch this space. We've got 3 pairs of tickets to give away, check out the competition on our Facebook page! Welcome the weekend with none other than Iris Yas Island resident DJ, Raz Delmundo. Half-priced Happy Hour drinks 6 - 8pm and breathtaking views of Yas Marina as standard, see you there! Now, when the F1 after-race concerts headliners have been announced: The Chemical Brothers, Lionel Richie and Rihanna wrapping up the weekend, who wouldn't like to WIN 2 TICKETS TO THE RACE! Spend AED 100 or more at Blu Sky to enter into the raffle today! Every Thursday Experience the latest smooth and stylish chilled house sessions with resident DJ Chris Delaney while enjoying Happy Hour drinks (AED 18++) until midnight and delicious food offers. Time goes by so fast... Stills at Crowne Plaza Yas Island celebrates its 7TH BIRTHDAY this week! Join the 7-day celebration with drinks priced at AED 7 only, the legendary Stills Burger plus a pint at AED 77 and more of Still's famous food offerings! The celebration kicks off at (you guessed it!) 7pm on Friday, with live performances by DC Jazz Boost & DJ Glen and lots of surprises for everyone so don't miss it! Such an impressive line-up at MAD on Yas Island! Hot off the back of last week's NE-YO live performance, Friday September 23 sees international vocalist & songwriter Eva Simons. Famed for her dancehall-infused single, "Policeman," featuring Jamaican vocalist Konshens, as well as the popular 'Bludfire', Eva has taken over the recent charts with her unique EDM vocals. Complimentary bar for ladies. For those looking for great Japanese food, a fabulous bar scene and an ultra hip setting, look no further than Sho Cho Abu Dhabi. Each Friday, DJ GEM.N.I takes guests on a nostalgic house party journey to the best of 80's and 90's. All pouring spirits are at just AED 30 between 4-8pm, and there is 20% discount on F&B for Etihad. Enjoy HAPPY HOUR and listen to the latest tunes by DJ Ragy as the sun sets over Abu Dhabi, this Friday after brunch party is at the highest bar in the city. For a top night out atRay's Bar, just head up to Level 62. Discover an epicurean expedition from around the world cuisine, experiencing a unique variety from 55&5th The Grill, Sontaya & Turquoiz paired with exclusive beverages every Friday from 1pm - 4pm at St Regis Saadiyat. Maya Fridays are pleased to welcome back DJ Rob Forrest & DJ Stew Magoo to Al Maya island this coming Friday 23 September, with Chad Phunk as support. 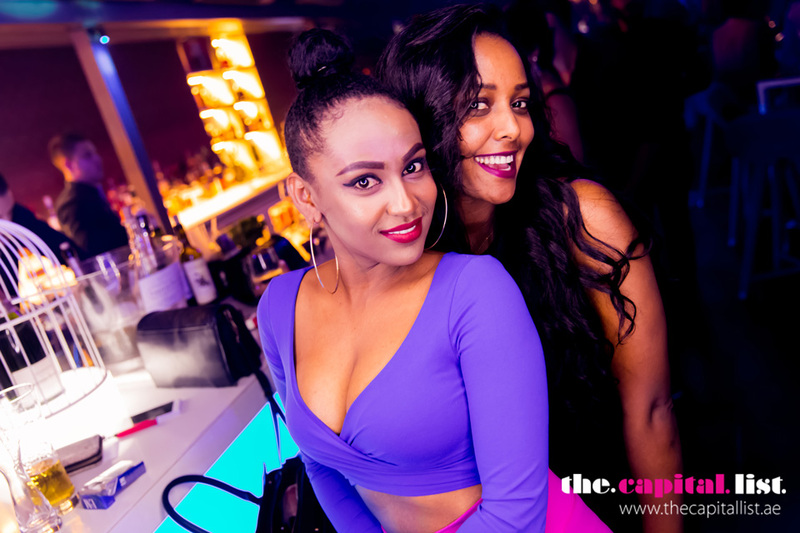 Ladies receive a complimentary drink + FREE entry before 1pm! Keep the celebration going! Take advantage of Stills unbeatable 7th Anniversary specials: drinks priced at AED 7 all week 23-29th Sep as well as the legendary Stills Burger plus a pint at AED 77 only!